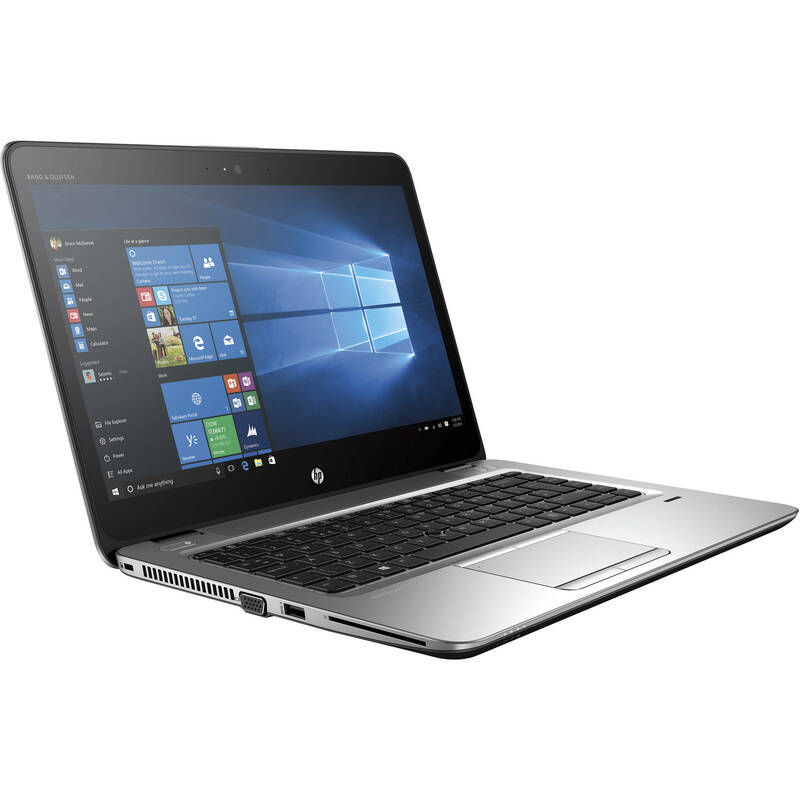 Designed for mobile professionals who require a rugged businesses notebook with enhanced system and graphics performance in a managed IT environment, the 14" EliteBook 745 G4 Laptop from HP helps drive performance with productivity features that allow you to stay connected and remain collaborative. It is powered by a 2.7 GHz AMD PRO A12-9800B Quad-Core APU and 8GB of 1866 MHz DDR4 RAM, allowing you to run multiple programs simultaneously and quickly access frequently used files and programs. When running more demanding programs or tasks, the processor can be boosted to achieve a speed of 3.6 GHz. The 14" SVA display features a TN LCD mode and a Full HD 16:9 resolution of 1920 x 1080. Visuals are handled by the integrated AMD Radeon R7 chipset, and you can output video to an external display using the DisplayPort and VGA outputs at resolutions up to 4096 x 2160 @ 60 Hz. For storage of your files, this system comes with a 256GB M.2 NVMe PCIe SSD that uses a PCIe 3.0 x4 interface and Tri-Level Cell (TLC) NAND flash memory. There is also one 2.5" / 7mm drive bay available for a SATA hard drive or SSD. If you want to add external storage, optical drives, mice, keyboards, printers, memory card readers, and more, the EliteBook 745 offers one USB 3.0 Type-C port, two USB 3.0 Type-A ports, one of which doubles as a charging port, and a docking connector. Built-in stereo speakers, dual microphones, and a 720p webcam let you participate in video calls for work or with friends and family. Connect to the Internet via 802.11ac Wi-Fi or Gigabit Ethernet LAN for a more stable and reliable connection. Furthermore, to free up USB ports and reduce wire clutter, you can connect additional peripherals and devices using Bluetooth 4.2, while a built-in 3-in-1 media card reader supports SD/SDHC/SDXC formats. The EliteBook 745 G4 Laptop operates using an included AC adapter that runs using 90-265 VAC at 47-63 Hz, a power cord, and a 3-cell / 51Wh lithium-ion polymer Long Life battery that will last for up to 11 hours before recharging is required, and also supports HP Fast Charging, which will charge the battery to 50% in around 30 minutes when the system is off or in standby mode. The installed operating system is Windows 10 Pro (64-bit). NFC is a set of communication protocols that enable two electronic devices, one of which is usually a portable device, such as a smartphone, to establish communication by bringing them within 1.6" of each other. NFC devices are used in contactless payment systems, similar to those used in credit cards and electronic ticket smartcards and allow mobile payment to replace/supplement these systems. NFC is used for social networking, for sharing contacts, photos, videos, or files. NFC-enabled devices can act as electronic identity documents and keycards. NFC offers a low-speed connection with simple setup that can be used to bootstrap more capable wireless connections. The current memory configuration is one 8GB module, with an additional 260-pin SO-DIMM slot available for upgrades. With both slots in use, this system supports 16GB of RAM, or 8GB per slot. The 14" SVA widescreen display of this HP notebook features LED backlighting, a TN LCD mode, a 16:9 aspect ratio, and a Full HD 1920 x 1080 resolution. The anti-glare finish allows you to work in brightly lit environments, and there is also a typical contrast ratio of 300:1, a refresh rate of 60 Hz, a brightness of 300 cd/m2, 157 pixels per inch, a response time of 16 ms, and viewing angles of 45/45/25/35°. Using the DisplayPort and VGA video outputs, users will be able to connect their system to an external display. The DisplayPort output supports resolutions of up to 4096 x 2160 @ 60 Hz and the VGA output supports resolutions up to 1920 x 1200 @ 60 Hz. Up to three independent displays are supported if used with the optional HP UltraSlim Docking Station. This HP notebook can connect to a home or public wireless network via 802.11ac (2x2) Wi-Fi. If you require a more reliable Internet connection, you can utilize the Gigabit Ethernet LAN jack. You can connect wirelessly to peripherals via Bluetooth 4.2 and there is also an available slot for a micro SIM card. The HP EliteBook 745 G4 has one USB 3.0 Type-C port and two USB 3.0 Type-A ports that will allow you to connect peripherals such as hard drives, printers, and memory card readers. At 5 Gb/s, USB 3.0 transfers data up to 10 times faster than USB 2.0, which operates at 480 Mb/s. USB 3.0's high-speed transfer rate helps to significantly reduce data transfer times, meaning you spend less time waiting and more time focusing on the task at hand. One of the USB 3.0 Type-A ports also doubles as a charging port and the USB 3.0 Type-C port delivers 15W of power. The EliteBook 745 G4 is MIL STD 810G certified. Keep your data secure with a Trusted Platform Module (TPM) chip, fingerprint reader, security lock slot, and Smart Card reader. Box Dimensions (LxWxH) 17.6 x 12.2 x 2.7"